FLAVOURS TRAIL CONCEPT: Kamloops is home to the Flavours Trail, a unique trail featuring the best local flavours of the area from signature wines, beers and ciders to fresh salmon, locally made chips & salsa, produce, baking, and more! A special brochure was designed and distributed in June outlining the trails, itineraries, signature culinary events, and more opportunities for flavourful exploration. PROMOTION CONCEPT: For the spring/summer, Tourism Kamloops invited people to explore the Flavours Trail, meeting the growers, vintners, bakers and producers who make Kamloops and area such a fresh and delicious place to adventure in. A mix of media platforms was used targeting all of B.C. with a strong focus on the Lower Mainland, one of Kamloops’ main target areas for short haul visitation. Of the 5,200 emails sent out, there were a total of 2227 (1218 unique) of opens and 650 (386 unique) click thrus. A promotion on Global TV ran from June 1 – 7 during the Morning News. The promotion included a 15 second promo commercial, on air contesting, Facebook promotion to 32,000 fans, and announcer mentions. A spike of traffic to the website and specific URL /flavourstrail was noted during the week of promotion. Overall traffic to the website June 1 – 7 was 18,297 visits. Overall traffic to the website June 7 – 15 was 18, 036. A Facebook campaign targeting all of B.C. 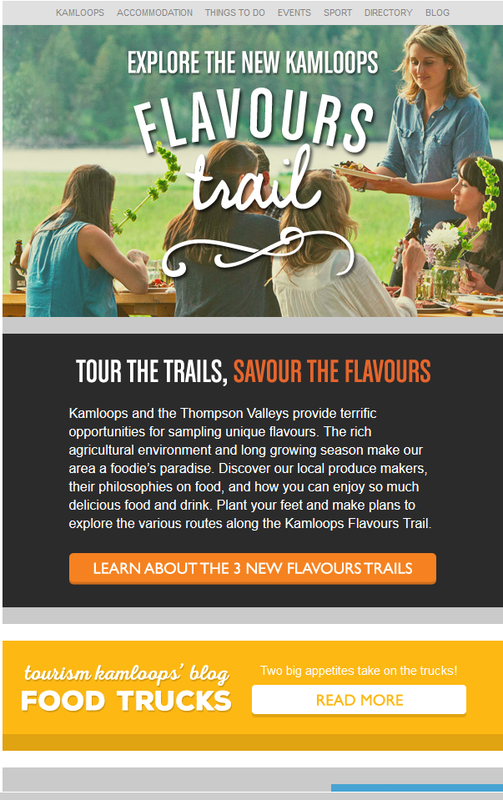 (same as Global reach – minus Kamloops) ran from May 28 to Aug 20 with messaging regarding the Flavours Trail with a video ad. This video highlighted the components in the Flavours Trail Brochure promoting the exploration of the trail leading direct to the main landing page, while other ads promoted the contesting and led to the contest page directly. Overall the campaign was a great success and garnered alot of attention for BC&apos;s newest Wine Region. (Report compiled by Meghan Grant).